The pier sat closed for a few months, and then, like the proverbial phoenix, the pier was reopened once again. However, only temporary repairs had been made and so, in May of 1995, the pier was once again closed for a short time to facilitate repairs to the damage caused by the 1992 and 1994 fires and earthquake. In April of 2000 a small fire eerily reminiscent of the 1994 blaze occurred due, apparently, to a poorly discarded cigarette. The Los Angeles Times reported “Diners Trapped as Small Fire Burns Hole in Seal Beach Pier.” A 4-foot-by-4-foot hole was burned through the pier and once again people were trapped at the end. The small fire led to a no-smoking ban on the pier, possibly the first such law at a SoCal pier. Seal Beach Says No Smoking on Pier — City Council cites fire safety concerns. ‘We’d like to keep our historical landmark and please don’t burn it down,’ mayor says. Less than a month after a fire trapped dozens of people at the end of the Seal Beach Pier, the City Council this week voted to ban smoking to prevent a similar potential disaster. The smoking prohibition is believed to be the first at an Orange County pier, an unheard-of safety precaution even at Southern California piers that have been devastated by fire in past decades—including the Santa Monica Pier, Redondo Beach Pier and Stearns Wharf in Santa Barbara. The pier was again closed for repairs in the spring of 2006 while the pier underwent a $500,000 rehabilitation that included replacement of the boat landing. In 2007 a portion of the wooden planks on the walkway were replaced—at a cost of $262,925. Then, in 2008, the pier was closed for a short time when huge waves knocked two wooden pilings off the boat ramp. It’s all part of the life of a pier. The pier soon was reopened although the end of the pier that had contained Ruby’s Restaurant remained closed. Work to fix the end section started in 2018 and we are waiting to see when the section will reopened — as well as if a new restaurant will built. Facilities: There are long wooden benches nicely designed for anglers, fish-cleaning stations, restrooms, and lights. There is limited one and two-hour free street parking but most people park at the large beach parking lot adjacent to the pier — $3 for two hours or $10 for the day. Across the street is “The Hangout Restaurant & Bar,” a local favorite that serves up really good breakfasts. 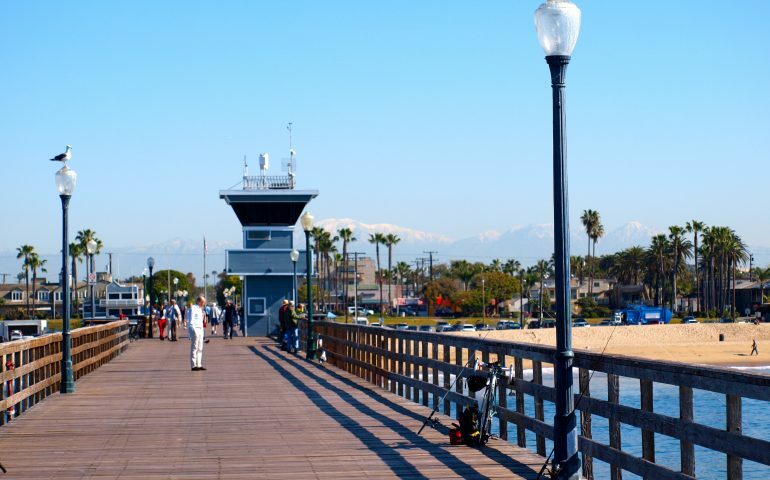 Unlike some of the more celebrated SoCal beach towns, Seal Beach is a family town with a small-town, friendly, relaxed atmosphere. It’s a nice place to visit—or live. Handicapped Facilities: Although there is handicapped parking, the restrooms are not equipped for the handicapped. The pier surface is wood and cement and the rail height is 43 inches. Posted for handicapped. How To Get There: From the Pacific Coast Highway simply take Main St. west and follow it to the pier. Management: City of Seal Beach.